I'm Sorry Kodak Wants How Much For Its New Super 8 Camera? The original Super 8 camera inspires nostalgia in every graying beardo with aspirations to make a film. The format was introduced back in 1965, and before VHS camcorders killed it in the 80s, it was the film stock of choice for budding filmmakers and family life chroniclers. A new Super 8 camera released 30-some years after Super 8 effectively died seems like a fun idea for people eager to relive the glory days or escape digital. Except in a blog last week Kodak claimed this thing will cost anywhere from $2500 to $3000. Yes. That is correct. When the Kodak Super 8 camera finally arrives (it was announced at CES way back in 2016 and only teased at CES this year) it will go for about the same price as and excellent digital camera (with lenses) like the Sony A7r ii, Canon 5D Mark III, or Panasonic GH5. Those are cutting edge cameras that produce video good enough to go on your TV or even the big screen. If you’ve already got a computer lying around then you don’t even need to spring for editing equipment. The new Super 8, conversely, will require access to a film editing suite, which means either making nice with a local community college filmmaking teacher or spending thousands to build your own suite (do not do this). So sure, you get to try your hand at shooting video on film, but it’s still much pricier than learning the ins and outs of filmmaking with a digital camera—or even your smartphone. Kodak’s blog hinting at the price of the new Super 8 camera is an exercise in weirdness. First there’s some admittedly gorgeous footage that’s supposedly from the camera. This stuff looks really damn good. It’s got the gauzy colors you instantly associate with old Super 8 footage, and it makes something like a GQ photoshoot featuring Cara Delevingne feel retro in a really fun way. But it also highlights the fact that Super 8 footage is really blurry and the colors are not true to life. This thing is “the aesthetic” first and solid filmmaking tool second. Particularly as I could probably accomplish the exact same look by shooting in soft focus with my GH5 and applying a couple of color filters in Adobe Premiere. Instead, the filmmakers and film teachers are comparing it to 30-year-old Super 8 cameras, and are getting pumped about the “added bonus of being able to manipulate the image, being able to change the lenses or being able to have some of those digital menu features. You know, features you can get with nearly any quality digital capture device available today. I don’t mean to sound purposely obtuse here. I recognize Super 8 still has a role in filmmaking schools as a tool to teach kids how to edit film, and new cameras with some of the tools found on digital devices will make those Super 8 shoots a lot easier. But let’s not pretend the only market for the Kodak Super 8 is the film school one. Kodak lent this device to filmmakers too, and it’s clearly hoping to capitalize on the nostalgia the mere mention of Super 8 engenders. Sort of like those Fuji, Polaroid, and Impossible instant cameras marketed to nostalgic photographers. Those cameras at least had the courtesy of being cheap (the priciest costs just $300). Kodak wants to sell its Super 8 for $2500 to $3000! That’s more than 20 times the price of a Super 8 camera on eBay, and a few hundred more than great digital shooters available from Sony, Canon, or Panasonic. For the price Kodak wants to ask, we could probably open source our own Super 8 camera and sell it on Kickstarter. 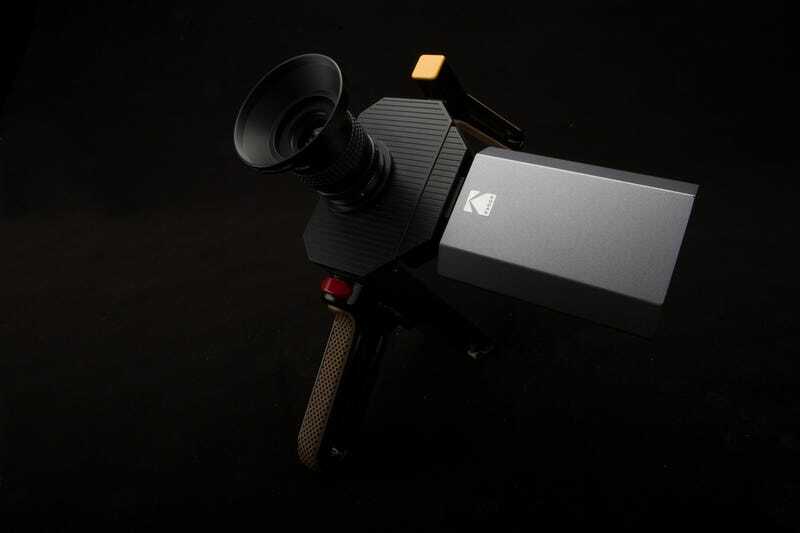 Kodak claims the new Super 8 camera should be available later this year.